PRAISE - Cheryl's Distinctive Creations, Inc. I use Cheryl’s all the time for my corporate events as I am an event planner myself. So when my special day came about I had to use her for my floral needs. She traveled all the way to Melbourne Beach to be part of my special day and my flowers turned out gorgeous. I wanted something romantic with a beach flair so I used hydrangeas, orchids, and soft roses. I couldn’t have been happier and my centerpieces turned out beautiful as well. I would definitely recommend them! 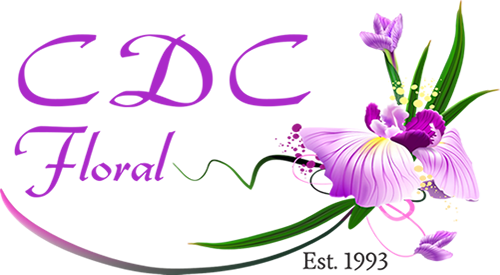 Cheryl’s Distinctive Creations, Inc. were a pleasure to do business with. They went above and beyond to meet our needs financially by offering various options and executed the vision for our wedding flawlessly. I just had an opportunity to walk to the new hospital tower lobby, second floor and front entrance and admire the beautiful holiday decorations. Now I can’t wait for next year and the year after that to add to the collection. Thank you so much for a job well done – the decorations are so tasteful and they beautifully enhance the décor of the new tower. Cheryl and her team were amazing! They worked with our schedule to meet about floral and had a lot of examples to look at. My floral arrangements were PERFECT! They are great about working with your budget and repurposing floral from the ceremony. Cheryl is highly recognized by the hotel I was using for my wedding. While I was already impressed by the way she handled my many changes to her contract prior to hiring her, the patience she had while I worked on my budget for the flowers, and our first meeting together, it wasn’t until I saw my flowers in person did I realize how even more incredible this woman is! I ADORED my bouquet! I just couldn’t get over how amazing they looked. I had even wanted a flower that wasn’t in season at the time and she convinced me to use a faux flower that looked almost alive (You would have never known it wasn’t real!) I loved the simplicity of the bridesmaids flowers and all my guests from the reception wanted to take a centerpiece home. We also rented an aisle runner and a linen backdrop that was set-up perfectly. Cheryl really took the time to make sure I was happy with everything and I can’t thank her enough for her amazing work. I don’t even know where to start! Everything about my flowers was perfect, and from beginning to end, Cheryl was absolutely amazing in helping me bring my vision to life. In the first meeting we spent almost 2 hours discussing options, and Cheryl was excellent at showing examples and doing mock setups in the studio, which made me really feel she understood my vision. The price was a little higher than other vendors, but she is great at providing an itemized contract so you can easily stay in budget or splurge in some areas to have exactly what you want. My flowers were definitely worth every penny, and she truly delivered exactly what I had hoped for my wedding!